Up to 15,000 people protested in Waterford over the possible downgrading of Waterford Regional Hospital, and other cuts to the health service. The non-political event was organised by Gillian Savage Corcoran and Andrea Galgey, who say they are "just concerned citizens". Under the banner of "South East Take a Stand - Save Waterford Regional Hospital", a joint Facebook campaign with over 20,000 members was organised within a week. Thousands of people gathered at Ballybricken at midday for the rally against a possible downgrading of the hospital and other issues affecting the city and surrounding region. 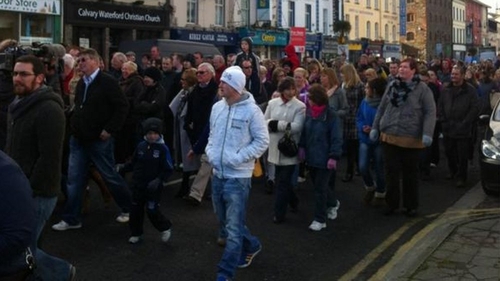 Following an address, the crowds marched down The Glen and Bridge Street, along the Quay and onto John Roberts Square. At Roberts Square, they met with another initiative, Waterford Gives a Shirt. The group collected over 20,000 shirts from Waterford people in recent weeks, to symbolise giving the Government the shirts from people’s backs. Gardaí and public representatives estimated that between 12,000 and 15,000 people attended the protest.